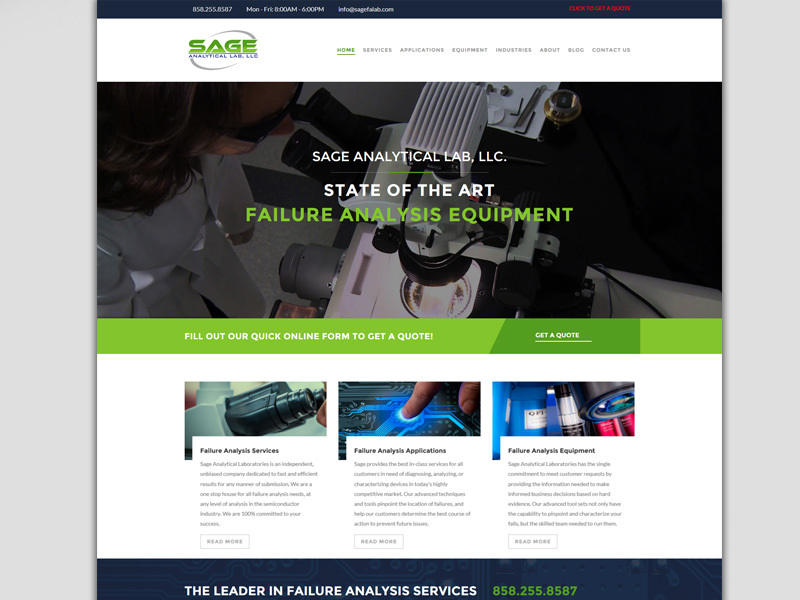 Sage Analytical Lab has been a leader in the field of failure analysis services and testing for years now. With their primary office in San Diego, their exceptional team of scientists, engineers, and technicians strive to meet and exceed all Failure Analysis needs. Rizer had been previously doing Online Marketing including a focus on Search Engine Optimization for Sage, which resulted in over 40 of their keywords being on the first page of google nationally including “Failure Analysis Lab”, “Failure Analysis San Diego”, “Failure Analysis Service”, and “Failure Analysis Equipment”. After seeing great results in search engines and an increase in traffic, the next objective was to focus on maximizing conversions from their site. Although their existing site had a lot of great content on it, the design and layout was outdated and discouraged users from wanting to dive deeper. Focus was put on a complete redesign process, with new and easier call to actions, forms, and site navigation structure. WordPress was used due to the ease up updating the site and its content on the backend.